Updated Monday September 3, 2018 by Chris Cox. Due to the amount of rain we have experienced in Springfield today, our diamonds are flooded. 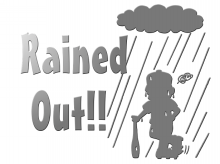 As a result, our Midget Girls Fall Evaluations are CANCELLED for tonight. Stay dry, everyone!